From Wadi Rum , you and your guide will go by jeep to visit the Nabatean Temple, a 2000 year old structure that is still remarkably well preserved. Next you will head to Lawrence Spring with its impressive views of the desert of Wadi Rum. Afterwards, we will take you to the Red Sand Dunes, where you can climb to the top to enjoy the view. Following this, you will go to see the Ancient Inscriptions left by trade caravans many centuries ago. At the Inscriptions, your guide will prepare your lunch while you take a rest for about an hour. Then you will move on to the Lawrence House, where Lawrence of Arabia is reported to have stayed with his army for 2 weeks. Next, you will go to the Um Frouth Rock Bridge, which you can also climb and enjoy the view from the top. The tour will continue as you go to the Little Bridge, which is easy to climb and offers a great view of the desert. From there, you will drive to Khazali Canyon, which features Nabatean and early Arab inscriptions and is also a great place to hike. Finally, we will drive you to a remote place in the desert, where you can watch the beautiful sunset. After sunset, your guide will cook dinner right before your eyes, and you can enjoy this meal under the beautiful stars in the remote solitude of the desert. The ininerary for the second day is a bit different. After breakfast, you will go by jeep to Jebal Burdah, where you will begin climbing towards the incredible Burdah Rock Bridge at the top of the mountain. This hike takes about 2 to 3 hours, and is moderately challenging. Your guide will help you in any tricky places. After reaching the bridge and enjoying the view from the top, you will descend the mountain and your guide will prepare lunch and Bedouin tea. When you finish your lunch, we will drive you to the beautiful Burrah Canyon, where you can hike for two hours. Afterwards, you will go to the Um Ishrin area, where your guide will cook a bedouin dinner and tea, and you can enjoy another night under the stars. 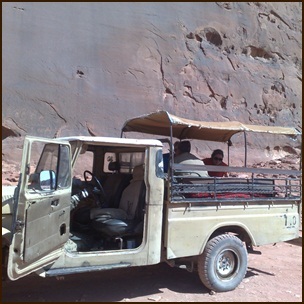 In the morning after breakfast we will drive you back to Wadi Rum village. This tour starts between 9 and 10 am.